Getting many questions about this, imrpoved my "guide" + added borderless window, which improves it even further. If you have modern high resolution screen, I strongly advise you to look into it. Exact same settings will work for sigma. 2. Click "Add window ( [HOTKEY] )"
I've found that there's a delay for the borderless to kick in whenever you enter a game, so setting a hotkey for the "Force key" setting can be useful. Alternative if you have issues with borderless window. It won't be borderless but allows you to resize window easily and get similar effect just with title bar. Use AHK script (autohotkey). x2/y2 = desired widnow resolution (for example 1440,1080 for 1440x1080 4:3 window). Edited by aerial 2 months. 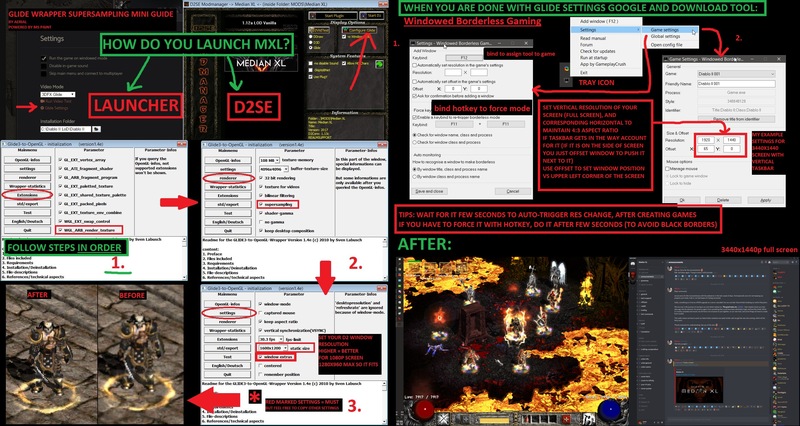 I have a little problem, when i play with glide and windowed it never enter in window mode, just full screen; and windowed borderless gaming dont read diablo II, m using w10. Sadly, enabling WGL_ARB_render_texture causes UI elements to flicker on AMD GPU, and it's the only option that enables Supersampling which is somewhat required to get it working, oh well, I guess I'll stick with Fullscreen. I'm not very savvy with using computer programs, my screen is 1920x1080, I've tried some different numbers but it is not scaling right. You want static size 1280x960, and then in borderless tool set to 1440x1080 (to maintain 4:3 aspect ratio). i will test this later when i reach my office laptop with median installed. borderless fullscreen + reshade would be neat. But im curious, what would happen if you tried to borderless to full 1080p res? the screenshot for dual monitor seem like 1 single ultra wide screen to me. But if you have 16:9, you will still be left with some free screen space if you upscale 4:3 d2 window. If you would set full screen res, it would stretch the game. Idea behind this is, that this is just better than having big d2 window, that is smaller than screen, if you don't want to use full screen. (960p in case of 1080p screen). This gives you borderless window that perfectly utilizes entire vertical resolution. As for reshade, I didn't explore it, I think I prefere standard. Thanks, Aerial, I'll give it a shot after this grinding run. So I set it up as 1280x960 Static and 1440x1080, however when I do that my game window while max shows on the bottom left portion of my screen, hiding well below taskbar. Akyrios wrote: So I set it up as 1280x960 Static and 1440x1080, however when I do that my game window while max shows on the bottom left portion of my screen, hiding well below taskbar. Position of window is controlled by offset parameters, directly under where you put resolution. Another thing: if you use taskbar that is at the bottom of screen, horizontal, you cant resize your window to 1440x1080p, because then part of the window will be under the taskbar. So you need to factor that in, check how many pixels your taskbar takes (can do this by trial and error). Let's say your taskbar is 50 pixels. Then your window must scale not to 1080p but to 1080-50 = 1030p. for 1050p it shows 1400 horizontal res, so 1400x1050. And if you don't put anything in offset box, your window will be touching left top corner of the screen, and reach all the way to the bottom taskbar, but not under the taskbar. In my screenshot example, I don't have taskbar at the bottom, so I don't need to do this, it can streach all the way to the bottom, utilizing my full 1440p res. But since my taskbar is on the left hand side of the screen, I need to put offset, so left edge of d2 window isn't covered by taskbar. Offset pushes the window by x pixels from left edge of screen. If for example someone used vertical taskbar on right side, you wouldn't have to do anything then, full res vertical + no offset, since it wouldn't colide with taskbar in any way.